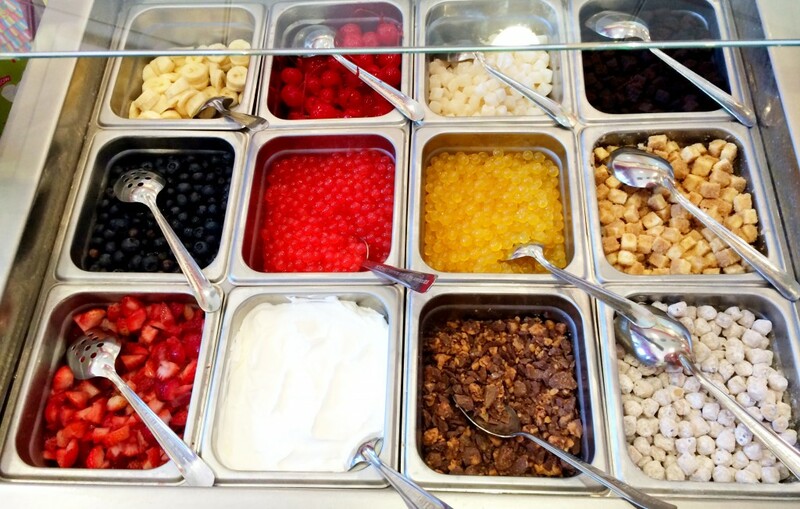 Right away you will notice that Menchie’s isn’t your ordinary yogurt shop. The second you open the door you are not only greeted by the helpful staff but by an amazing smell. Menchie’s makes fresh waffle cups and I must admit, they were amazing. Menchie’s has something for everyone. Menchie’s offers non-fat, gluten-free, dairy free, low carb, no sugar added and vegan options and uses only the best quality ingredients. 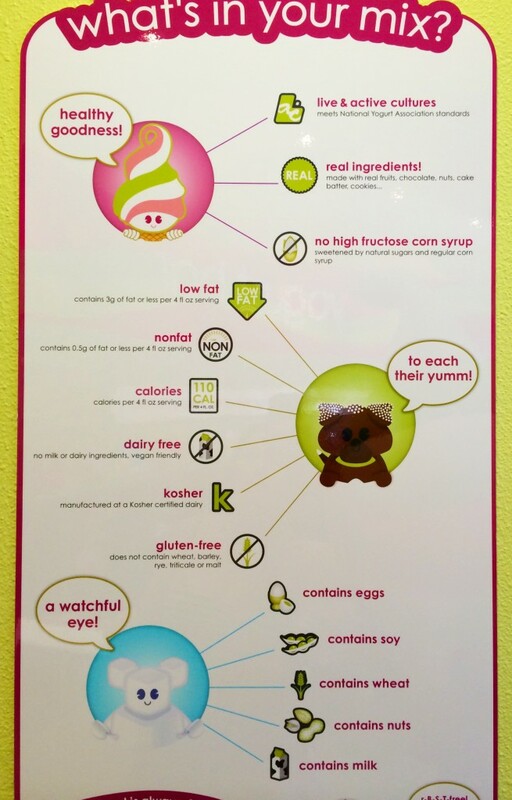 Menchie’s has symbols on each flavor label letting you know exactly what’s in your yogurt. For those of you with a food allergy, you are able to identify easily if the yogurt contains nuts, eggs, soy, wheat or milk. Menchie’s yogurt comes from “Happy California Cows” that live in nice weather year-round and are not treated with the growth hormone rBST. 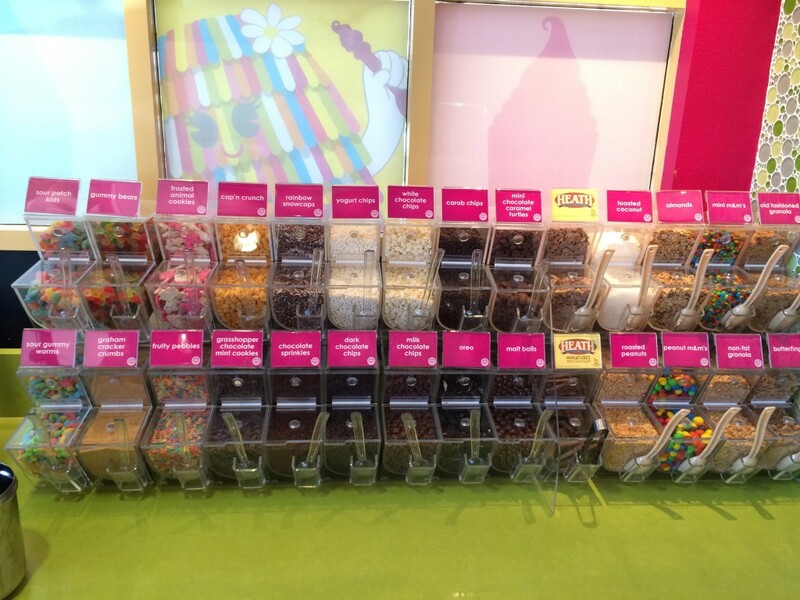 Menchie’s offers a large variety of yogurt and sorbet and a flavor of the month. My favorite flavor today was a toss-up between the Peachy Keen & Heath Bar and my daughter could not get enough of the Vanilla Snow. What I noticed about Menchie’s topping bar is that they have separated all nut toppings to one side and they are easily identified by the tan-colored spoons. They also have your favorite fresh toppings, as well as Caramel and Hot Fudge. 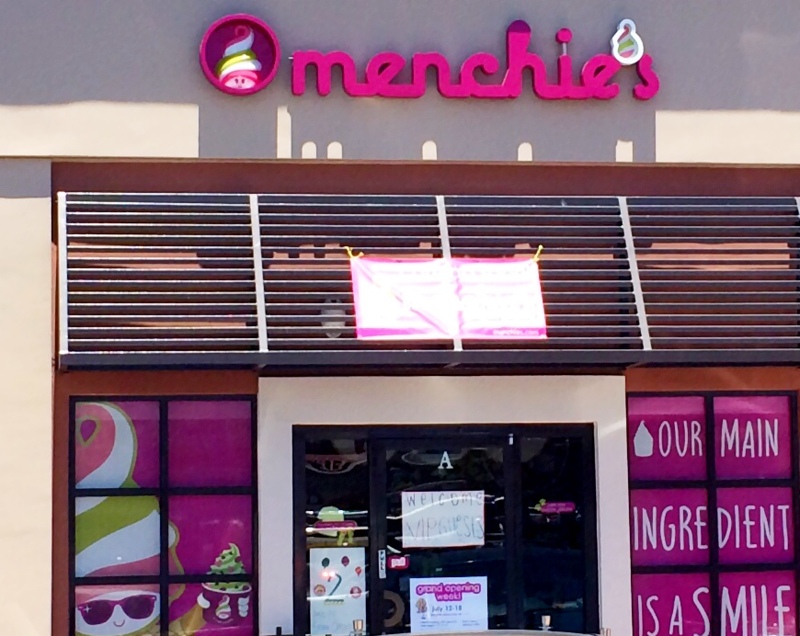 Menchie’s Grand Opening week starts tomorrow, Saturday, June 12th at 11:00 am with free yogurt all day and a free t-shirt to the first 25 guests at 11:00am. Each day for the next week, there will be specials. 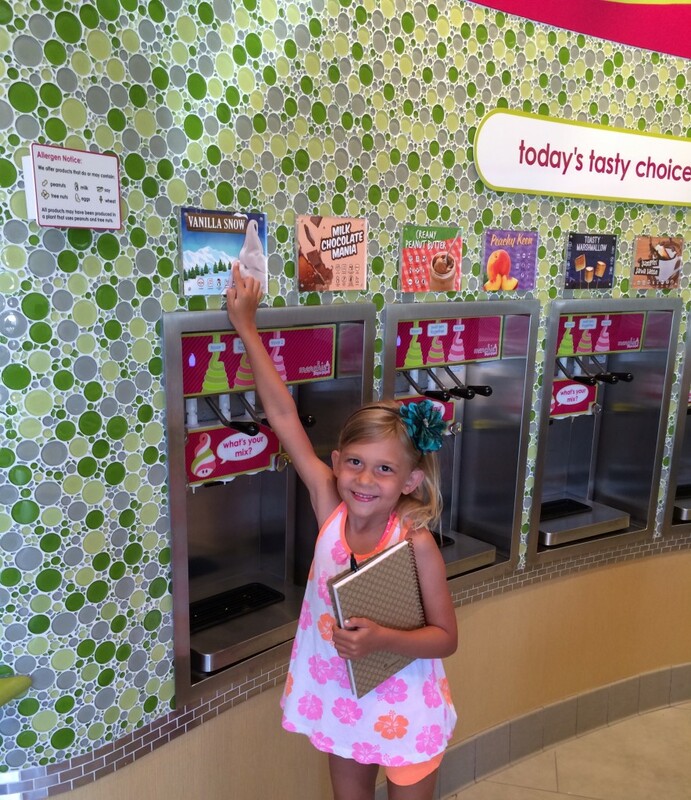 Gather up the kids and come to Menchie’s for a frozen treat! 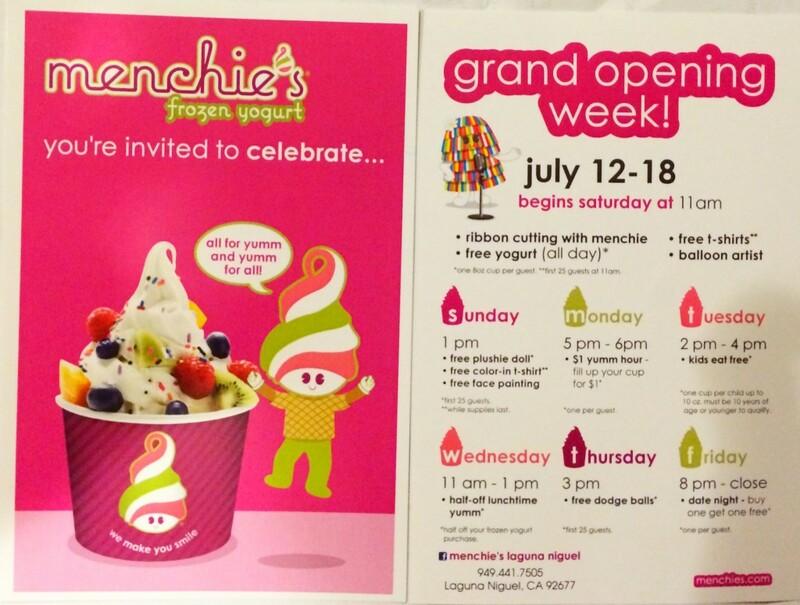 Menchie’s is located at 30211 Golden Lantern, Suite A in Laguna Niguel. Learn more about Menchie’s on Facebook, Twitter and Instagram. My favorite is NY Cheesecake.